The Royal Pharmaceutical Society (RPS) hopes a planned UK-wide foundation programme will help newly-qualified pharmacists who feel “isolated and unsupervised”. The society submitted recommendations for the foundation programme to the UK's four chief pharmaceutical officers at the end of January, RPS faculty chair Peter Kopelman told the chief pharmaceutical officer's conference in London earlier this month (March 15). “I’m pleased to say we have the support of those chief pharmaceutical officers,” he said. Mr Kopelman told C+D at the conference that pharmacists at the beginning of their careers are “given a lot of responsibility, and they don't feel that they have the appropriate supervision and oversight that they would like”. “What they want to see is much greater clarity around their potential career framework and the pathways to achieving their ambitions, whether that be in hospital, community or general practice,” he continued. 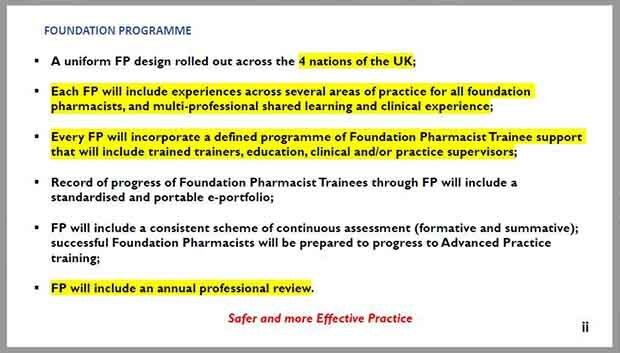 The initiative would involve a two-year foundation programme with two annual reviews, which could inform a pharmacist’s revalidation entries, Mr Kopelman explained. The earliest the programme could be rolled out to pilot sites would be September 2019, he added. To monitor it, the RPS has proposed a postgraduate pharmacy training board involving itself, the General Pharmaceutical Council (GPhC), “NHS pharmacy education and training structures” and “employers”, Mr Kopelman said. At the conference, GPhC chief executive Duncan Rudkin said he had “lost count of the number of times relatively newly-qualified pharmacists have told me how disillusioned they have become very quickly following entry into community pharmacy practice”. Did you feel "isolated" as a newly-qualifed pharmacist? The whole suggestion shows how out of touch the RPS Faculty is with real life I am very sorry to say. It appears to be a desperate attempt to justify the faculty's own existence by putting another layer of bureaucracy onto newly qualified pharmacists. We still need a fully functioning professional body that understands that the vast majority of community pharmacists are employees and represents us properly. To stop newly qualified pharmacists from being disillusioned be honest with them from the bigening about what to expect once they qualify. Unfortunately universitiea are businesses and they just need the money. Multiples are just as much to blame with their targets that treat the nhs like cash cow, bullying pharmacists into doing unnecessary services and blacklisting locums that dare to speak up. Now that want to bring in tech and remote supervision. I'm sorry but it doesn't take a genius to figure out why pharmacists are disillusioned. I say pharmacists because it's not just newly qualified that are disillusioned. RPS will lose faith of its members and pharmacists in general if they don't deal with the real issues. It's not the isolation its pigeons coming home to roost that the lies told in social media and chemist and druggist are not true and they realise what life in pharmacy is really like!